College years are almost always looked back on as the best years in one’s life. And students who attend UCSD or San Diego State have even more to celebrate than someone attending a boring little community college in the middle of Kansas. The top water damage San Diego companies want our local students to stay safe while having fun, but when you are right out of high school sometimes those lines can be blurred. Fraternity and sorority life is a time-honored tradition and allows student to become nurtured in an environment designed to help them succeed. But sometimes hazing and over-aggressive pranks can cause trouble and the need for water damage restoration services to be performed by a company that is available 24/7 (let’s face it; these disasters don’t happen mid-day). Here are two common water-based initiation activities and pranks that every college student should avoid performing. Whether you pluck the little guy out from his bowl or down him in a cup of his own water, this should be avoided first and foremost because it is cruel. First of all, fish have personalities, they have feelings and they are social creatures. Being swallowed alive for the price of getting a few laughs will present the fish with a slow, painful death as it slowly suffocates while being eaten up by your stomach acids. 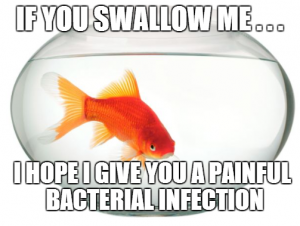 Swallowing a live fish can also make you very sick. Gold fish have a protective film covering their body that is high in bacteria. You can get explosive diarrhea, stomach cramps and even bacterial infections by digesting live goldfish. And what if you vomit and the puke gets trapped between your floor boards causing a mold problem to grow? You will need a disaster restoration company to come in and perform their services on your dime! You wouldn’t want to suffer the slow death met by Boba Fett when he fell into the Sarlacc, would you? You loved ‘Finding Nemo’, right? Then think twice about swallowing a live gold fish in your next prank because it’s not the 1950s anymore and you can find more original, cruel-free pranks to pull. One of the local water damage San Diego teams in the city was actually called to perform water extractions and restoration services in a house of college guys where multiple people were water boarded by their peers in some twisted game. But the main reason to avoid doing this is that (1) it provides a fast ticket to getting expelled from school and (2) it is extremely dangerous. Water boarding is a controversial interrogation technique because it can leave someone permanently brain damaged or dead. It can also inflict long-lasting psychological problems. Water boarding gives the sensation of drowning. In some cases (depending on how things are set up) water can actually get into the person’s nose and mouth. The individual’s mind believes he is drowning and the gag reflex kicks in as if he was choking on waves constantly rolling in while being trapped unable to move. The American Civil Liberties Union regards water boarding as a dangerous, cruel process that is far from being a game. Never mind the excess water that will flood your floors and warp your tiles and hardwoods; you run the risk of seriously injuring someone, or even killing them. Ask any water damage San Diego technicians and they will say to keep it safe and keep it outdoors where water belongs. Don’t do anything cruel or dangerous, but have fun and get edgy. If you are initiating people into a fraternity consider making them wear a dress and a woman’s wig and make them skip merrily through the sprinkler system while people pelt them with soft, rotten fruit. No harm; no foul!